Through social media, Filipino celebrities are able to connect directly with other Pinoy stars as well as their fans. In particular, Coco Martin uses Instagram to interact with stars from rival network GMA-7. From being the lead actor of Ang Probinsyano, Coco has expanded his responsibilities to become the director and creative consultant of the ABS-CBN prime-time series. Since it aired its pilot episode on September 28, 2015, Ang Probinsyano is now considered the longest running action drama series on Philippine television. In this series, Coco brings life to SPO2 Ricardo "Cardo" Dalisay. His character is a police officer who eventually becomes the leader of a vigilante group called the Vendetta. In recent episodes, Cardo and his fellow Vendetta group members have already surrendered to the authorities. For the past three years, Ang Probinsyano has been pitted against various GMA-7 programs. One of them is Victor Magtanggol, which aired from July 30, 2018 to November 16, 2018. It was replaced by Cain at Abel, which aired from November 19, 2018 to February 15, 2019. The lead stars of these two Kapuso shows have had the chance to communicate with Coco through his Instagram account. Last March 24, Coco posted Instagram videos of Eat Bulaga hosts Jose Manalo and Wally Bayola. The hosts of the GMA-7 noontime show did a comedy sketch wherein they talked about the developments in Ang Probinsyano. Coco shared the Instavids by putting laughing emojis in the captions. His former Probinsyano co-star, Jhong Hilario, also found the videos hilarious and he wrote "Hahahahaa" in the comments section. In the first Instagram video, Wally kept on telling Jose that he only heard about details about the ABS-CBN show. "Kwento sa akin, kinakanta 'yan sa Probinsyano kaya hindi ko alam yun. Binugbog raw 'yan, si Cardo," said Wally. "Sino si Cardo?" asked Jose. "Si Coco Martin," answered Wally. 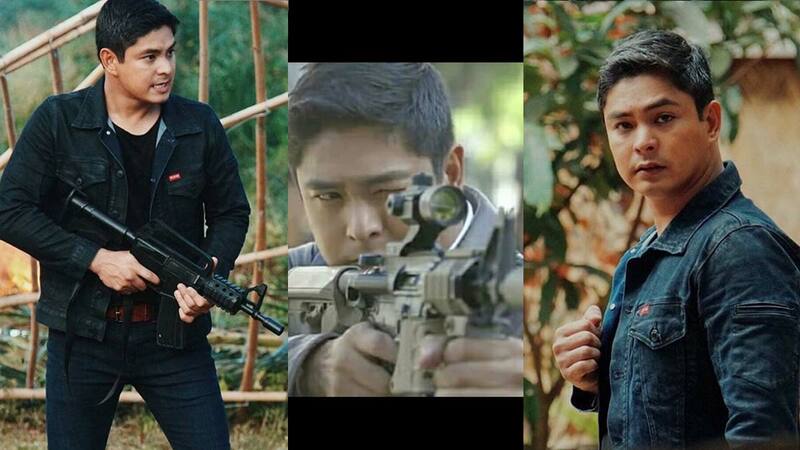 Jose confirmed that Cardo is the lead actor of Probinsyano. Wally added: "Babalik siya sa training ng SAF tapos magpapaalam siya kay Alyana." Jose then asked Wally to name the actress portraying Alyana, the wife of Cardo. Wally said Yassi Pressman is the person cast as Alyana. The second video shared by Coco on his Instagram account tackled the rebel group Pulang Araw. Dabarkad Wally described an emotional scene by saying, "Ang kwento sa akin, nung nagpaalam si Cardo, hindi siya mapigilan ni Alyana, pagtulo ng luha sa kanang mata." He also referred to John Arcilla as a "buwitre" (vulture) who called the shots. "Pinalusob niya ang Pulang Araw," said Wally, referring to the rebel group featured in the Kapamilya show. The third Instagram video mentioned the characters of Lito Lapid and Jhong Hilario. Wally narrated, "Tinawagan ni buwitre si Alakdan..."
"Sino naman si Alakdan?" asked Jose. "Si Jhong Hilario," explained Wally. Wally then imitated the way John spoke: "Umalis na kayo diyan dahil dudurugin ng SAF ang Pulang Araw..."
Jose observed, "Pati boses naikwento sa iyo?" In the fourth video shared by Coco in his Instagram account, the Dabarkads talked about the vigilante group of Cardo called the Vendetta. "Kakampi nila ang pangulo ng Pilipinas," said Wally. Jose asked if he was referring to Philippine president Rodrigo Duterte. Wally clarified, "Hindi. Yung kapatid ni Randy Santiago...Si Rowell Santiago." Finally, Jose asked: "Sino ba nagkukwento sa iyo?" Wally joked, "Yung anak mo, di ba, kasama dun?" He was referring to Benj Manalo, the son of Jose Manalo. Benj is cast as Felipe "Pinggoy" Tanyag Jr. in Ang Probinsyano. Coco Martin used Instagram to react to the rumored GMA-7 ban on him. This supposedly took place during the promo period for their movie Jack Em Popoy: The Puliscredibles. Coco joined Vic Sotto and Maine Mendoza in this Metro Manila Film Festival (MMFF) 2018 entry. She pointed out that Maine may have simply forgotten to mention her co-star Coco while promoting their MMFF 2018 entry. Lolit also wrote: “Imposible na hindi pagbigyan ng GMA si Coco dahil alam din ng lahat na sa 7 nag umpisa ang career ni Coco Martin. Huwag na nating bigyan ng malisya na hindi siya nabanggit, baka may big pakulo para sa announcement ng naturang movie, malay natin, wait lang tayo." In response to the Instagram post of Lolit, Coco wrote in the comments section that he will never get angry at GMA-7 because the Kapuso Network paved the way for him to enter showbiz. He was part of GMA-7's all-male group The Studs that was introduced in 2008. Coco wrote in the comments section of the Instagram post: “Nay okey lang po yun at naiintindihan ko. Sobrang taas po ng respeto ko sa GMA dahil sila ang unang nagbukas ng sakin ng pintuan lalo na si Sir Joey Abacan, napakabait po nila sa akin kaya wala pong problema sa akin yun. Instagram also paved the way for Kapuso stars to reach out to Coco. Despite their TV rivalry, Coco and Dennis Trillo showed that there is no network war ongoing between the two of them. GMA-7 actor Dennis congratulated Coco for the high ratings of his ABS-CBN show Ang Probinsyano. Dennis topbills the GMA-7 prime-time series Cain at Abel, which is the direct competitor of Ang Probinsyano in the ratings game. It all started when Coco posted a quote card showing how Ang Probinsyano got higher ratings compared to its rival Cain at Abel, based on Kantar Media data. According to Kantar Media, Ang Probinsyano registered a national TV rating of 41.7% while Cain at Abel registered 13.7%. Meanwhile, Ang Probinsyano got a Kantar rating of 44.3% in rural Philippines while Cain at Abel got 13.3%. In his Instagram post, Coco thanked viewers by writing: "Maraming salamat po!" In response, Dennis posted in the comments section: "Congrats sa inyo brad!" The Kapuso star even tagged Coco to ensure that he would read his comment. Pinoy celebrities had mixed reactions when a meme became viral for showing the date of the supposed end of Ang Probinsyano. The fictitious title card indicated that Ang Probinsyano will air until 2048. Even the stars of Coco’s rival show on GMA-7 were amused by the post of the Kapamilya action star. Victor Magtanggol lead stars Alden Richards and Janine Gutierrez reacted by leaving laughing emojis in the comments section of Coco's post. To express his gratitude to Joey de Leon, Coco left a comment in the Instagram post of the Eat Bulaga host. Teka Mona is a comedy skit show that aired on TV5 from 2006 to 2007. The Kapamilya actor then expressed his wish to meet Joey in the future so he could thank him personally.